I have a QTableWidget with a disabled setSelectionMode (QTableWidget::NoSelection) and the QTableWidgetItems I fill in don't have the Qt::ItemIsEditable flag. How can I disable this "cursor"? To elaborate a bit: the appearance of the items is governed by the palette of the view which you can retrieve with the TableWidget::palette() method. Note that it is returned as const so you have get a copy, change it and then apply it by using setPalette. Note also that here I simply set the cell color to white and the text color to black, ideally you would set it specifically to the default cell colors (also available from the palette). Note finally that in my case the item still retained a different border from the default one which I didn't attempt to address here. if this doesn't do the trick, then I am running rapidly out of ideas. These statements will disable the selection of table in cells.. But the problem is that, you can not work with keyboard for going up and down on the QTableWidget. So I think that solution is not good. Not the answer you're looking for? Browse other questions tagged python c++ qt qt4 qtablewidget or ask your own question. Hide the border of the selected cell in qtablewidget in pyqt? 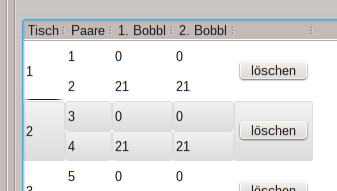 How do you turn off the row “cursor” in a QTableWidget instance?